Petaluma Artificial Synthetic Grass. This is one of the most ambitious projects done by Better Than Real Artificial Grass. A whole make over was done in all the green areas of this property: front yard, backyard, sideyard next to the driveway. Artificial synthetic grass turf & sod made this house look like brand new. Even the dog living there posed very excited for a picture approving his new green areas. Artificial synthetic grass turf & sod for dog runs offers a neat, non-toxic, resistant, safe and easy to clean after environment for your pet. 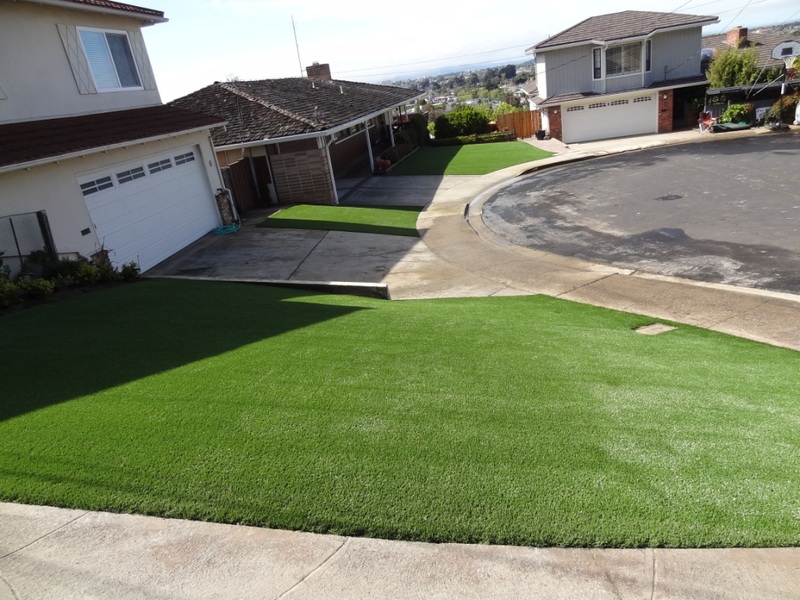 All the pictures were taken by the property owner while the installation was being done and after it was completed, who was very excited and satisfied with the installation of artificial synthetic turf & sod at his house. Better Than Real Artificial Grass offers its artificial synthetic grass installation services in the entire Bay Area, California, in cities like Alameda, Belmont, Berkeley, Burlingame, Concord, Corte Madera, Cupertino, Daly City, Danville, Dublin, Fairfield, Foster City, Fremont, Hillsborough, Livermore, Los Altos Hills, Los Gatos, Menlo Park, Morgan Hill, Mountain View, Napa, Novato, Oakland, Palo Alto, Petaluma, Pleasanton, Redwood City, Rohnert Park, Sacramento, San Carlos, San Francisco, San Jose, San Leandro, San Mateo, San Rafael, San Ramon, Santa Clara, Santa Rosa, Saratoga, Sonoma, South San Francisco, Sunnyvale, Walnut Creek and many cities more. Better Than Real Artificial Grass also installs synthetic grass in the cities of Santa Cruz, Monterey, Pacific Grove, Pebble Beach and Carmel. We specialize in artificial synthetic grass installations for commercial & residential applications, artificial turf for dog runs, minigolfs, playgrounds, putting greens and sport fields.